The Angelina County Airport is a constant presence in Burke life, especially at night. Those who live within range of its rotating beacom know that it constantly strobes everything within its range -- RED...GREEN...RED...GREEN...etc. The airport is located just east of Highway 59 and central Burke. The airport originally had only a north-south runway, but later a longe east-west runway was added. There are no commercial flights into the Airport, although at one time it was served by Texas International. Commercial flights for the area now use the Nacogdoches airport which lies between Lufkin and Nacogdoches. At one time the Angelina County Airport hosted commercial flight by Trans Texas Airways, the prececessor to Texas International, which later becamse Continental. In the 1950s TTA used the Douglas DC-3, affectionatel known as the "Gooney Bird" in World War II where it served its country as the C-47.Like clockwork TTA brought the world to Burke. When residents saw the DC-3 lazily settling into the Airport, they would say "Here Comes Old Trans." 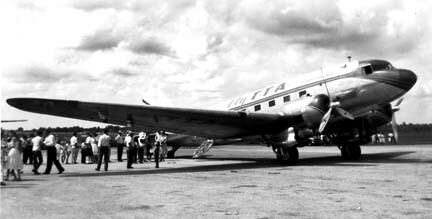 The photo of a TTA DC-3 below was taken at an airshow at the Airport in 1960. About 1954 an Air Force jet trainer operating from Bryan developed problems and souight to land at the Angelina County Airport. When the pilot radioed in, he was reportedly told the airport was closed and that the runway lights could not be turned on. The Webmaster lived within a mile of the airport at the time and remembers the roar of the jet engine as it passed the airport. The jet flew northwest of the airport and crashed in Hoshall in a field just outside the yard of a residence of a totally deaf man. The crash created a crater on the Thomas Mullins farm and sent part of the airplane all across the field and into several trees. The residents found residue of the crash for several years as they plowed their fields. Both Lloyd Burrous of Burke and his son Billy were avid pilots. Billy was flying a small airplane from the Airport but for unknown reasons crashed into the field across the road from the south end of the runway and was killed. The Webmaster recalls visiting the crash site and seeing the twisted, burned wreckage. A number of years later his father Lloyd was killed when he crashed his World War II era Ryan PT-22 trainer on the airport grounds. He reportedly lost an engine and tried to turn back to the runway to land, a cardinal error for pilots in that type of emergency. He had taken off on the same runway in the same direction as Billy and perhaps he turned back when he remembered what had happened to his son. During the late 1950's there were several July 4 airshows at the airport. The Webmaster recalls several military cargo planes on display and a flyover by an F-80 fighter. The Webmaster also remembers a stunt in which someone was supposedly making their first parachute jump. The "person" exited the airplane directly over the airport and fell to the ground on the far side of the runway without his chute's ever opening. People were horrified until the emcee announced that the victim was a dummy. In 1975 the Webmaster learned to fly in the Dallas area. On a visit to East Texas, he rented a Cessna 150 at the Nacogdoches airport and flew it over his parents' home at Burke and landed at the Angelina County Airport. Ed Williams, the father of Eunice Faye (Mrs. JIm) Spears, used to cut and bale hay on the airport grounds. He would hire young neighhood boys to ride the baler and report on any broken bales or other problems. Donald Burrous was working for Ed one summer, and Don invited the Webmaster to participate without asking Ed. The naive Webmaster rode the baler all day, expecting to get paid something. Naturally Ed, thinking the Webmaster had ridden the baler only for fun, paid only Don. The Webmaster learned a good lesson about the necessity of reaching agreement on a job before expecting to be paid. Although it is not related to the Airport pe se, the Webmaster while living near the airport in the mid 1950s remembers seeing B-36 bombers, probably from the Strategic Air Command, flying overhead at a very high altitude. The engines of the giant propeller-driven bomber were synchronized, which means that they made a slow undulating roar as the sound of one engine beat against the sound of another.